A joint effort between the American Society of Plumbing Engineers (ASPE) and American Rainwater Catchment Systems Association has resulted in the publication of a safety standard for rainwater collection and harvesting. The Federal Way School District uses its RainBank installed rainwater collection system for bus and district vehicle washing. With eight 2,500 gallon tanks yielding 20,000 gallons of storage, there will be ample amounts of water for the tasks during the school year and rainy season, plus a surplus for the summer for irrigation of new plantings. With well over 10,000 square feet of roof and an average annual rainfall of 37 inches, the school should go into the summer with full tanks and have an added 2-4 inches of rain in the summer to help keep the water storage tanks full. Ken Blair says “I like seeing more innovative ways to utilize rainfall in our region. You can’t find a better climate for rainwater harvesting than the Pacific North West”. 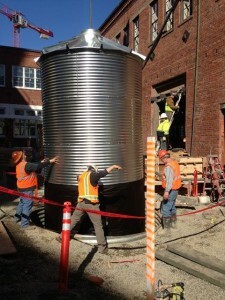 RainBank recently completed construction of three steel rainwater collection tanks for the Vulcan Project in South Lake Union. Seattle. 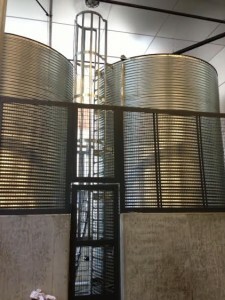 All three tanks will be used for toilet flushing and irrigation. Reducing stormwater for commercial projects is a direct approach to stormwater runoff and reducing pollution in the Puget Sound. Through landscaping irrigation, large commercial projects are infiltrating stormwater from rainwater collection rather than sending it down storm drains. Since toilets are the larger use of city water, harvested rainwater for toilet flushing can mitigate up to 70 percent of water used at a commercial building. Do you want to learn more on how your business can reduce the cost of city water usage while reducing stormwater runoff? Leave a comment below.